My relationship with Eastern National began in 1976 when travelling between my home in Bocking Churchstreet to Chelmsford County High School For Girls on Broomfield Road. I'd never travelled unaccompanied on a bus before. Some 30 years later, I do the journey in my dreams. The outward-bound bus stop was opposite The Lillies cul-de-sac on Bocking Churchstreet. The homeward-bound stop was a few yards past The Lillies - almost a door-to-door service by a 311/312 Halstead to Chelmsford via Braintree. On a few occasions I came home out of normal hours on a 310 or 313; these bypassed Bocking and went along Broad Road, so I had to walk from the Four Releet crossroads or down the footpath beside Monken Hadley (then a residential home for blind people). The 311 went via Gosfield, the 312 didn't and there was a similar situation with the 310 and 313. EN's front entrance Bristol Lodekkas (FLFs) used on that route mostly had green vinyl seating. A few seats had stick-on vinyl repairs, but the main concern seemed to be spillages rather than slashed seats. One of the buses had the green vinyl peeling from the side of the luggage compartment under the stairs. These little details personalised the buses for us and for the crews. The layout will be familiar to EN fans. Sitting on the long benches over the rear wheels made for an interesting time on corners, especially with the faster drivers. Upstairs there was a 4-person bench in front of the stairs which was okay if you were with your mates, but no-one liked climbing over the knees of 3 strangers to get off the bus. There was a single seat with an armrest opposite the top of the stairs. CHS girls only sat at the back of the upper deck if they were snogging KEGS boys; I think that was a long bench as well. The chugging, crunching, rattling and creaking noises of the Lodekkas became the musical background to my schooldays, even more than the famous RE "whine". The single seat upstairs was my favourite for the first couple of years except when Tom was the conductor. When he was on, I sat downstairs at the front to chat with him about Bocking and Braintree during his childhood and about bus travel. I knew most of the conductors' names or nicknames, but only Tom to talk to. The others I remember were "Popeye" (one of his eyes didn't move, his name was Eric), Jean (tinted hair), Dolly (short and stout with white hair) and Mark (who had lost the tip off one finger). I only got to know some of the drivers later when EN phased in one-man operator buses on that route during peak times. The kids saw Tom as an easy target for teasing because of his stooped back and because he was the only chatty conductor. They didn't dare tease the others who seemed more intimidating and commanded more respect from the passengers. A regular taunt was "when is the last bus to Greenstead Green?" (there weren't any). It was Tom who pointed out the fleet number plate inside the bus (near the window between the driver's cab and the stairwell) and told me about the double-deckers and their idiosyncrasies . 2789 was apparently a favourite with crews because it was a nice ride and didn't throw them about too much (Halstead-based, Gardner engine for those who like to know these things). Another Lodekka, whose fleet number I don't recall, was disliked because it tilted so much on corners the crews didn't think it was safe. I never came across that one myself. I also found out just how good the Lodekka's brakes were on an emergency stop! One evening we were chugging along Church Lane between Gauden Road and Wordsworth Road and the bus stopped dead. It was so sudden I don't even recall any screeching brakes or screeching tyres, but there were a few screeching passengers. I was in the front seat, just behind the doors and I slammed into the partition in front of me. Passengers all shot forward out of their seats. I don't know where (or who) the conductor was at the time, but we stopped while s/he checked no-one was hurt. This was in the days before people sued over every bump and bruise so after a brief discussion between driver and conductor it was ding-ding and we were on our way. I asked what had happened and was told an elderly woman had crossed the road in front of the bus. Thanks to the driver's excellent reflexes and the bus's excellent brakes, we didn't hit her. It's hard to imagine how she didn't spot a big green Lodekka chugging along - it was hardly a stealthy vehicle! The conductors sometimes enforced order between passengers as well as collecting fares. One afternoon there was a drunk in one of the back seats of the very full bus and he verbally harrassed us girls on the trip back towards Braintree. He tried to get one or other of us to sit next to him. Tom, the conductor warned him several times about his behaviour and eventually put him off the bus near Chatham Green, making much-teased Tom the hero of the day. That was also the only time I heard the 4-dings emergency signal. He had the bad luck to have a chap throw up on the bus one morning and we all had to change buses at Braintree; the replacement was a one-man operator bus. That morning the driver was Gerry, making it the "Tom and Gerry" bus. Such events, trivial in the life of the crew, were the things that become memorable. Another thing that sticks in my mind is people smoking on the bus. On double-deckers smoking was allowed on the upper deck only. It also seemed restricted to cigarettes though I can't remember if that was a rule or social convention. Each upstairs seat had a metal stubber on the back. Sometimes the conductors would go upstairs to smoke on a quiet section of the route. They seemed to prefer roll-ups, perhaps because these could be extinguished and re-lit. On single deckers, there was a glass partition halfway back and smoking was allowed in the rear section. Braintree bus park was, as the name suggests, more of a tarmac parking lot than a bus station. The one-way system meant we went 3 and a half sides of a square to reach the ramp down from Manor Street when heading towards Chelmsford. On a few of the return journeys to Bocking when passengers weren't in a hurry to get to work, we also went through the bus garage opposite the Embassy cinema for the bus to be topped up. I found this small detour tremendously exciting the first few times. That bus garage has long gone. The Braintree to Chelmsford stretch was a straight run apart from the detour through Little Waltham and the Essex Show detour on show days. This was long before the bypass and the roundabouts sprang up. On show days, the bus stops were temporarily moved to the pull-in at the main showground pedestrian entrance. On those days the traffic, especially on the afternoon run back from Chelmsford, was very heavy and the bus could get stuck for 20 minutes. On the year of the Queen's visit, we were stuck in traffic for at least half an hour on a sunny day and our legs got even more stuck to the green vinyl seats than usual! The conductors often opened the concertina-style doors to get more ventilation. Sometimes the conductor got out to chat to the driver while we were gridlocked. In later years the one man op buses were used, albeit with conductors still on board, and some of the regulars were tolerated chatting to the drivers while the vehicle was stationary. It didn't escape my notice that attractive young women were more privileged in this respect! If I missed that bus, there was another half an hour later, but if I was at an after-school activity I had to get a 310 that terminated at Braintree. This was a one man single decker. I seem to recall that some of the singles had tan vinyl seats, slightly softer vinyl than the green stuff on the Lodekkas. There was a connection with a 311 or 312 that did Halstead-Braintree-Halstead and arrived at Braintree about 10 mins later. Watching the driver or conductor winding the handle to change the bus number and destination was always a source of interest. During peak times, EN used 2-man buses with the half-cab on the Halstead-Braintree-Chelmsford route. Outside of peak times and at weekends, they also ran one man buses (the doubles had "posh" moquette seating). During the late 1970s and as late as 1981 (when I moved and changed bus routes), even if they ran a one man bus during peak times, they still had crew. That was when I got to know some of the drivers though the only ones I remember were Harry, Charlie and Gerry. If I was the only person getting off at The Lillies, they dropped me at the top of the close, saving me a short walk. This was greatly appreciated in winter when it was already dark. The only other driver I was on "nodding terms" with was Harry. In theory, if we walked from school to the Bus Station and got on the bus from Bay 1, we had to pay 3p (covering the stage between the Bus Station and Swiss Avenue). Some of the drivers enforced this, others didn't. Harry used to rib us about being too lazy to walk back up the road and unless there was an inspector around, he let us off the 3p fare. In 2010, I met another of the drivers from the 311 route, John Day, who now has a preserved ex-Eastern National VR and an open top KSW (I can vaguely recall his face from school days, but can’t remember chatting to him back then). One evening I got the later bus (one man operator) from the Bus Station. It stopped at Swiss Avenue and wouldn't start again. After several attempts, the driver apologised to the passengers and went to the phone box to call the Bus Station. Being so close to the Bus Station, we had a replacement within about 15 minutes. I mentioned this exciting adventure to friends, only to be told that the bus had once broken down in Little Waltham and some of the bigger KEGS boys had push-started it! In the late 70s we had some severe winters. Standing at the bus stop in the morning, those round headlamps and brightly lit upper deck front windows coming through the darkness or fog were welcome sights. Steamed up windows on wet days were used for numerous games of hangman or noughts-and-crosses. On one snowy morning the bus arrived about 10 minutes late - the conductor then told us this was the earlier bus turning up 40 minutes late due to snow and ice on the roads between Halstead and Bocking Churchstreet. It took another 30 minutes to get to Braintree Bus Park. More than once during those winters we got to the Bus Park and waited while the crew went to find out if the roads were passable. There were some winding sections and gradients that simply weren't safe when iced over. Sometimes an earlier crew phoned back (from a phone kiosk in those days) to say the road was impassable, or at least unsafe for buses, further along. Some of my friends got stuck in snow at Great Leighs. When their bus finally limped into Chelmsford, the school had been closed due to the weather and they had to do the whole snowbound journey home. The heaters were efficient and it was snug inside the bus on a chilly day. When the buses couldn't get through, we disembarked at Braintree Bus Park and waited to be told if EN would let us use our Bus Passes to go home on. The school bus passes normally weren't valid for the return journey before 2pm. Often we were told we could use our passes to go home after 10 am, which meant spending about an hour in Braintree until peak time was over. In the really atrocious conditions, Eastern National couldn't guarantee a return journey from Chelmsford so it was safer to send us straight home instead. Thirty odd years on, I realise I never had a chance to thank the drivers for transporting us safely in such atrocious conditions (except for those I’ve since met at preservation events). I particularly remember the buses being cosy on rainy and foggy mornings. By twenty to eight I'd be under the canopy of the bus stop a short walk from home. Usually there'd be four or five of us, including former classmate Andrew who won a place at the boys' grammar school at the same time I won a place to the girls' school. In the cold and rain it was a very reassuring sight (and sound!) when the old bus came into view round the curve of the road with the interior lights on and the headlights glowing. Inside would be a bit steamy and perhaps smell of wet clothing, but it had a safe and homely atmosphere. In the fog we'd look out for the headlamps, sometimes being fooled by the occasional delivery lorry. They came through fog as disembodied lights before the interior lights and the looming dark shape of the vehicle could be discerned. As I got into my teens, I liked to go into Braintree on a Saturday. Usually I got a lift in and came back by bus, almost always on a one man operator 310 or 313 which meant walking from the Four Releet. If I knew the driver and it was a quiet section of the route, I might be allowed to stand up front or perch on the luggage rack to chat. If the bus was hailed, I went back to my seat until we were moving again. I felt privileged to be allowed those chats. At weekends I sometimes got the bus from Braintree to Maldon to visit friends. At that time, Maldon had a bus station. I remember very little about those journeys except they used single deckers and, of course, the drivers were all strangers to me. In 1981 my family moved to the other side of Chelmsford which meant the end of the 311 for me. I now used the number 11 route from Chelmsford to Southend via East Hanningfield. My stop was Howe Green. I used to look out for Tom, Charlie, Gerry and Harry at the Bus Station when waiting for a bus and by then, the peak-time two man crews were being well and truly phased out. The buses used on number 11 route seemed to be mostly one man operator double deckers. The Howe Green bus stop Chelmsford-bound was opposite East Hanningfield Road. Often it took the bus 10 minutes to turn onto Southend Road (old A130) due to heavy traffic. Nowadays the bypass (new A130) takes much of the traffic. The stop on the way home was too far from my house for a "driver's special" drop-off and I didn't know the drivers that well anyway. That changed a bit in 1982. The bus made it out of the junction and into the bus stop, but then the traffic stopped completely. Eventually the driver turned off the engine. Car drivers were getting out of their cars and we were told there'd been a serious accident and the road was closed in both directions. The only forward movement was due to car drivers turning around and going back the other way. For some reason we had an extra EN employee on that day and he was chatting to the driver. They told us we were going to be stuck for quite a while. As we were stuck at the bus stop, I offered to go home for a flask of coffee - an offer well-received. When I got back, the bus still hadn't moved. They were chattier for a while, but in 3 or 4 years I never managed more than nodding terms with the drivers on that route. When I started work I continued to get the number 11, this time from outside the Regent Theatre (Bingo Hall) on Moulsham Street before it was pedestrianised and the bus stops were moved onto Parkway. With the demise of two man crews, the friendships and camaraderie that built up between regular passengers and conductors no longer happened. On the one man operator buses, you weren't supposed to speak to drivers and this was being enforced on the urban routes. I can't see sixth-formers being allowed to push-start broken down buses either these days. Back in the 1970s, Eastern National felt like an extended family. RIP Eastern National Bristol FLF HD 2789 (AVX 957B), sadly scrapped. You were the bus I always wanted to own. I miss you. Being female, people seem to expect me to be interested in stereotypically feminine pursuits such as shopping, frocks and make-up, none of which have ever appealed to me. As a small child I played with Lego, Matchbox vehicles and Hot Wheels racing cars. A few relatives seemed to think I should develop an interest in dollies or tea sets, but any dollies, if not dismembered, were quickly passed on to my more normal sisters. This tomboy child eventually went into engineering, something jokingly blamed on one of my early memories being of dad sitting me on the wing of a Spitfire at Denham when I was about 3 years old! Until secondary school, my only brushes with buses were school trips and occasional outings with my grandparents on the other side of London. I'm fairly sure one of those outings was on a Routemaster as I remember the platform and I insisted on sitting upstairs (early 1970s, Eltham and Sidcup area - feel free to correct me). A later one was possibly a Fleetline, certainly a one man op vehicle (shopping trip in Eltham mid 1970s, again feel free to correct me!). I've previously written about the years commuting to secondary school by Eastern National and how I fell in love with Bristol FLFs (the VRs that replaced coming a close second). But how did I fall in with the bus fraternity? I made the mistake of setting up home with a partner when I was still a teenager. It seemed a good idea at the time. He was a firm believer in the motorcar so I didn't use buses again until we'd split up in the 1990s. By then the buses had changed a fair bit and Eastern National's familiar green livery (I missed most of their "spinach and custard" livery era) had been replaced by the white, pink and blue of First. With passenger numbers still declining, the vehicles on my local routes were mainly Optare Solos and Wright Volvos. I missed the old green Bristols so when I later found an FLF (and it was green!) in Bristol Industrial Museum, my date took 10 minutes to haul me off of it. The next partner couldn't understand why I'd rather use London buses than the much faster tube or spend a whole day in the London Transport Museum. Evidently my relationships with buses were more meaningful – and certainly longer lasting - than my relationships with men! In 2009 I became ill due to stress at work. While almost housebound I discovered Flickr and since part of recovering was "getting out of the house" I swapped my film SLR for a digital SLR, visiting places by public transport as I wasn't up to driving. One outing was the Southend seafront running weekend - I enjoyed it so much I went both days. A lass photographing buses was evidently an oddity, but everyone seemed friendly and I even got a lift home on a Bristol RE as a reward for pointing out a predatory traffic warden (or was I already being groomed as a potential volunteer?). On the way home, I shut my eyes and the familiar sounds and rhythms sent me back to being 12 years old on the "late bus" back from school. "Are you going to Showbus?" they asked. I'd been planning to visit Duxford for ages, hadn't I? I did visit a couple of hangars in between bumping into familiar people and admiring preserved buses. I had so much fun I went to the Canvey Island October Rally where my soon-to-be-ex-partner quickly got bored, but I had a blast. I missed New Year 2010 running day due to a broken shoulder, went Rail Replacement spotting over the winter and then offered to help at events: marshalling at Clacton, conducting at Colchester and Canvey (preferably on a Bristol! ), catering at North Weald and Showbus and visiting Ipswich Transport Museum, Ensign running days and Acton Depot ... hang on, I keep meeting people/vehicles from Clacton/Colchester/Canvey. Before we're even out of 2010, I was scheduling in events for 2011. I must be clear that my interests aren't all bus-related as I do the round of local country shows, air shows, military shows and local steam railways indulging my photography hobby, but for getting involved and for socialising, rather than just being on the sidelines photographing, I'd be at rallies and running days. And if there was a chance to conduct on my favourite ex-Eastern National VR or RE ....... (thanks gents for putting up with me on your buses). Since I was 12 I've wanted to drive (and own!) a bus. Who knows, I might actually achieve at least one childhood ambition! For me, Eastern National will always be associated with NBC-green, Bristol buses and the old Chelmsford bus station of my schooldays. Skip ahead to 2009 and a certain Steven Hughes arranged for me to have a lift back to Chelmsford on David Edwards' RE (FWC439H). It was this journey that rekindled my nostalgia for all things Eastern National. In return, I volunteered to do some rally marshalling and conducting and discovered John Day's Eastern National VR (UAR597W), a sister to the VRs of my schooldays and attached myself to her as conductor. Having rediscovered the vehicles familiar from my youth, I had a childhood ambition to achieve - to get behind the wheel of a bus. At the tail end of 2010, again arranged by Steven Hughes, I had my first taste of bus driving including a turn in Fred Lawrance's Bristol LH, UVX7S (fleet no 1103). I thoroughly enjoyed myself and Fred later asked if I wanted to buy 1103. In terms of nostalgia, 1103 ticked all the boxes - mid-1970s, green, Bristol and Eastern National - with the advantage of being thoroughly restored. After being interrogated by friends worried I hadn't thought through the practicalities (time, effort and running costs - buying the bus is the cheap bit), I said "Yes". After all, if I don't do this now, I will always regret never having tried. 1103 fitted right into my bus-travelling era even though Eastern National's LHs didn't ply the routes I used. That won't prevent me displaying those routes on her destination blinds rather a lot! Some preservationists will be dismayed that I'm retaining her anachronistic and customised livery, but I see 1103 as a celebration of Eastern National, rather than a faithful re-creation of either her in-service days or of my childhood memories. May 2011 marked my first proper experience behind the wheel of UVX7S driving on the A120 and around some country road. Not everyone likes “heavy” steering or manual gearboxes, but to someone who’s never had power steering in a car, I felt right at home. She’s a lovely vehicle to drive – some ambitions are worth the wait. 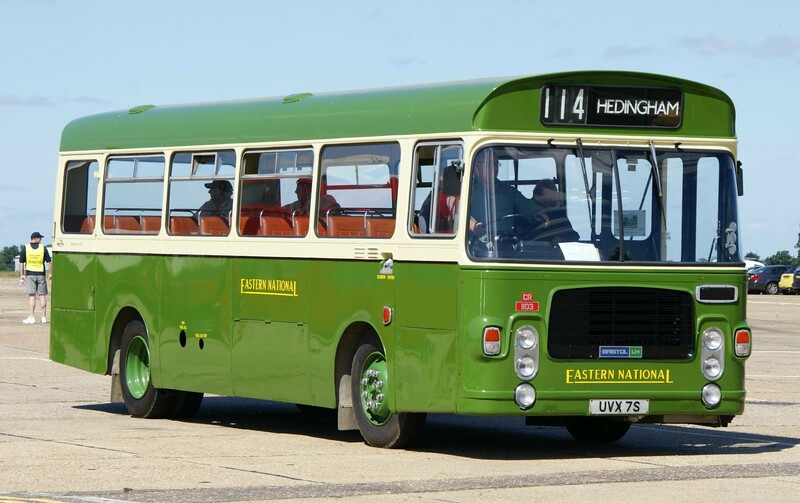 And for nostalgia’s sake – she often displays 311 HALSTEAD on the destination blind.